Rescue Update #2 /Hawks Aloft Inc. Remember back in June that Hawks Aloft had one crazy week in which we performed five bird rescues? A previous blog post provided an update on the baby Great Horned Owl. 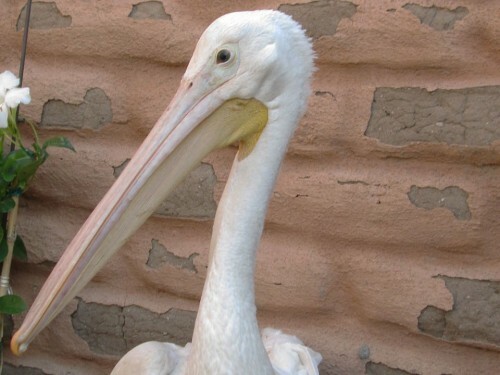 Here is an update on the American White Pelican with a droopy wing. The bird was transferred to Lori Paras, Director of the Santa Fe Raptor Center. They have named her Queen B (B for bug) because of the extraordinary number of bugs in her mouth and on her body. This is common in pelicans. They have a symbiotic relationship and the bugs clean the bird’s mouth and throat. Queen B had a shoulder girdle fracture a challenging fix for Doc Ramsay. If they do not heal properly, the bird will not be able to fly. Dr. Kathleen Ramsey of the Cottonwood Veterinary Clinic in Espanola performed surgery on Queen B. She was under anesthesia for 4 hours, which is a very long time for a bird. At this point, the surgery appears to have been successful. The wing is still wrapped and will be until the wing no longer has a severe droop. It will be periodically unwrapped for exams. The bird’s ultimate rehabilitation outcome is still uncertain. One very good sign is that she is eating fish from a pool. Since she will be in rehab for a long time, that makes it much easier to feed her and know she is getting proper nutrition. She currently resides in a 50 foot flight cage and is adapting well to her new surroundings. 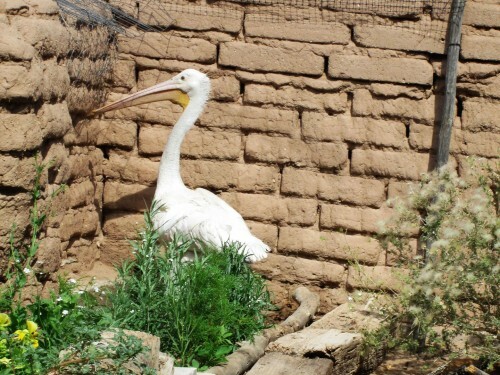 She will probably have to winter over in rehab, but Santa Fe is too cold for an American White Pelican. Lori is examining rehabilitation facilities and zoos in the southern part of the state to see if someone can house her for the winter. Click here to read a story on Queen B from the Albuquerque Journal.